These are the things and people i think are dumb, stupid, and i can't stand. I put "Things I Can't Stand" because we should stop the hatred. I hate Skinhead punx, Charlatans or posers, Good Charlotte, Blink 182, Box Car Racer, KKK, Fascist, New Found Glory, Stereotypes, terrorists, Aviril Lavine, spinach. 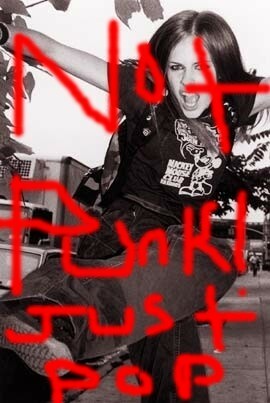 This is a pic of that stupid charlatan who thinks she's a punk but she isn't!